Experience the total vacation at Negril in one of the best locations this side of heaven. Let your cares go as you trek ankle-deep through shimmering white sands. Immerse yourself in the crystal-clear waters of the Caribbean, then tan on our private beach. Later, gaze fascinated at a magnificent tropical sunset. Crystal Waters is one, two, and three bedroom villas, each with living/dining room, kitchen and patio. Tastefully furnished, you will enjoy air-conditioned comfort in every bedroom. Each bedroom has its own bathroom. For each villa there's a trained housekeeper/cook to take care of the daily chores. She'll tempt your palate and satisfy your appetite with some of the tastiest dishes served this side of the Caribbean. On this dazzling stretch of Negril Beach, Crystal Waters stands in the centre-within easy walking distance of water sports facilities, hotels, and restaurants entertainment. Taxis are always available for the short ride into town. While there you can go shopping, browse through the crafts market and, if you care for a change, dine at one of Negril's several restaurants. At evening see a live Reggae show; go to a disco. We aim to please. Should you require fresh fruits and vegetables, fish or lobster, the management and staff stand ready to help. We'll arrange sightseeing tours, golf, tennis and horseback riding. Just make your request. 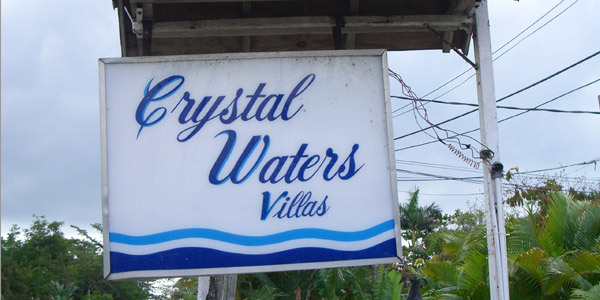 So, why not stay at Crystal Waters Villas your home away from home and enjoy the excitement that's Negril. Or relax laze on our sparking private beach and do nothing at all. Negril, is located on the west coast of Jamaica, 1 1/4 hrs. drive from the international airport in Montego Bay. Add 10% Sales Tax and 10% Service Charge. Rates in U.S. Dollars. Rates include Cook/Housekeeper for each Villa - Food Not Included. All rates are per Villa per Night.